Haul: Hair treatment, hand cream & chocolate! I had this polish on the table for a long long time, but it was never the right time for it. There is simply not much color in this polish and I like bright colors. It has purple base and a lot of emerald green and lilac shimmer which is visible in the different light. Beautiful duo chrome nail polish like Zoya – Ki, but it’s a little less lively. I used two coats, without any problems with application. How does it looks like in the bottle? Gorgeous. I like multi-color nail polishes. I’m thinking which flower in our garden looks like my nail polish selected? 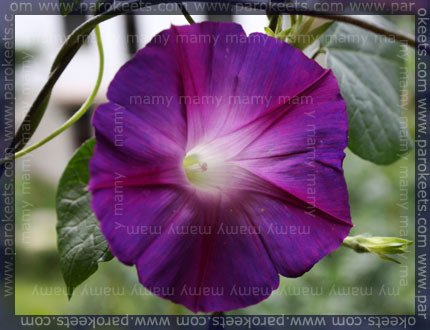 I choose Morning Glory. Use it where you want to have some privacy. Na tvojo polt lepo pride, jaz sem pa svojega oddala ker mi ni pristajal. Adina has been in my wishlist forever! .-= Mamy´s last post … NOTD- Zoya – Adina =-. .-= Gejba´s last post … Giveaway- Essence Eclipse and Return To Paradise =-. .-= Tassa´s last post … OPI Shrek Forever After Collection – Who the Shrek Are You =-. what a beautifull color. Like it so much! .-= elchy´s last post … Ready To Be Bitten =-. .-= Maestra´s last post … Maestra’s summer vacation – day 3 =-. I’m wearing it right now, going to write an article about it. I love the polish, but it doesn’t come through on photo’s. Do Not Send Email Notifications.Send Email Notification ONLY If Someone Replies To My Comment(s).Send Email Notification Whenever A New Comment Is Posted. Notify me of followup comments To Only My Comment via e-mail. Welcome to our paradise on Earth, where Parokeets ladies share with you our love for makeup and other pretty things.You can find tips&tricks, reviews or just a quick advice.